The Dragon Gate Eight Formations' main theorem refers to the utilising of Water formulas to identify and create locations with superb Feng Shui qualities. 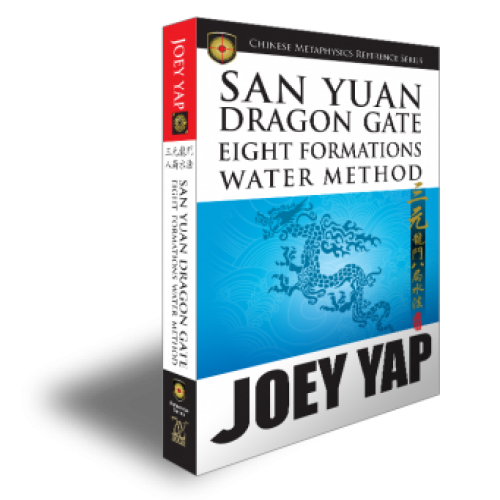 This transliterated version of an ancient classic of the San Yuan Long Men Ba Ju Shui Fa (Dragon Gate Eight Formations) highlights the tenets and theorems of all San Yuan Water Formulas, acting as an essential reference to all students and practitioners. The methodology to Qian Formation is presented through diagrams and tables. An analysis on The Kun Formations and a look at its various components. Uncover the essential knowledge on Li Formation. The Kan Formation, and its many theorems, is the central focus of this section. Deciphering the Zhen Formation could boost your understanding. A look into the analysis of Xun Formation. Learn more on Dui Formation through charts and diagram. Easy reference for formula and theorem of Gen Formation is spread out.